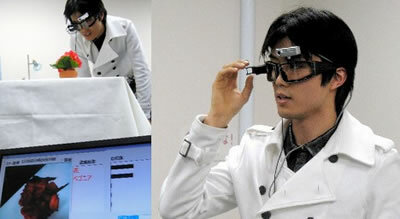 Smart goggles created by University of Tokyo researchers can not only remember what you see, but can also identify various items. The camera above the goggles is connected to a backpack computer system that records whatever you are looking at. The system also can be taught about particular items; it assigns a name to each object and then indexes the video footage so that every frame in which an object appears can be readily accessed. High-speed image recognition processing is what does the trick; when the user asks to see footage related to a particular object, the corresponding video plays in a tiny LCD attached to the right lens. The device could help elderly people with memory problems to lead a more independent life. It could also be used to sift through large amounts of video for particular objects (like looking through Youtube for every instance of someone with, say, a motorcycle). This device cuts across a variety of cool sfnal devices. I thought about the True-Vu lenses from Brin's Earth right away, of course. But i also thought about Ava, the object recognition computer from The Calcutta Chromosome, a very clever 1995 novel by Amitav Ghosh. In the novel, Antar works for an artificial intelligence, a computer that needed human details about everything. From Cyber Goggles: High-tech memory aid.